You are currently browsing the category archive for the ‘Eggplant’ category. 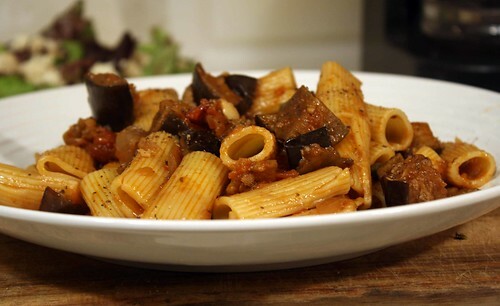 Pasta, Burek, Eggplant and Harvest Grains, and Madison! I got a lot of things to share with everyone tonight! Sorry for not blogging for a while. Last week I was a bit busy so I didn’t have time to blog. Luckily I found some time tonight! 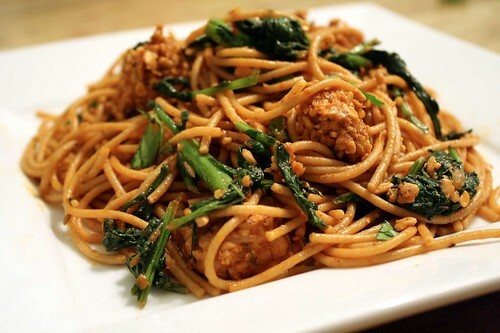 Last Monday I made the Spicy Tempeh and Broccoli Rabe Pasta from Veganomicon. This was my second time making this pasta dish. The first time it was super bitter from the Broccoli Rabe, I didn’t enjoy it much the first time. I decided to give it another chance with spaghetti this time because it was all I had. My mom prepares Broccoli Rabe very well so I decided to ask her about the secrets. My mom says broccoli rabe has to be blanched for one to two minutes and then dropped into ice cold water. Just like tempeh where it has to be boiled for a couple of minutes to remove the bitterness, broccoli rabe benefits from the boiling water too. I decidedto try the blanching and it worked great! The blanching defiantly removes some of the bitterness of the Broccoli Rabe making it taste pleasant.. I really enjoyed the flavorful spicy tempeh and the slightly bitter broccoli rabe. I will now make this tasty pasta dish more often. I hope everyone reading this blog has Veganomicon, if you don’t I highly suggest getting it! Isa and Terry have taught me so much about cooking! Moving along on Wednesday I made and Albanian recipe. 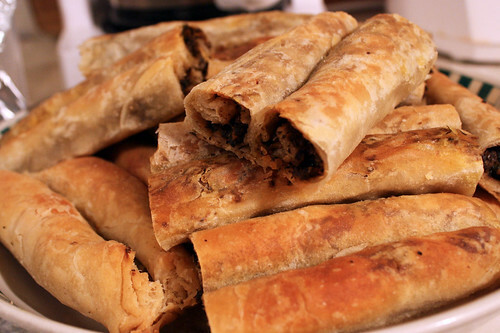 It is called Pita or Burek, in Albanian. My family mostly calls it Pita, I’ll refer it to Burek since it is more popular way to say it. There are many versions for Burek there is a coil version similar to the picture and a regular square version. I still havn’t learned how to make the dough fully by myself. My grandma made the dough for this pita and I made the filling. My mom is so good at rolling Burek dough, she can make its nice and thin. My grandma made it a bit thicker which is how she makes it all the time. It is very rare for Albanians to have recipes, we usually just eyeball everything. I ask my mom where are your recipes and she says “they are all in my head”. Next time I want to actually develop a recipe for the dough which should be fun! You can always take the easy route and just use phyllo dough but then it would be more like a Burek. I used a mixed mushroom filling for this Burek. 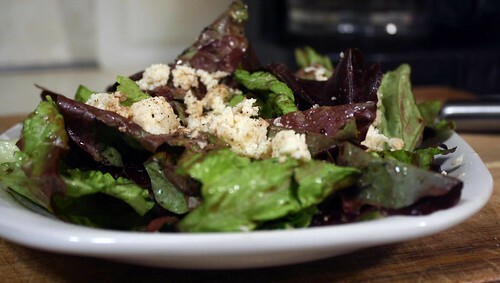 Tradionally the two major fillings are cheese or ground meat and sometimes spinach/cheese. My mom always develops interesting fillings for Burek. She came up with this one a while back when we bought a lot of mushrooms. The first time my mom made it I was suprised with how good it was. I really love mushrooms and I was so happy my mom invented this new filling! I don’t have the recipe ready completely. I want to create an easy to follow recipe for Pita/Burek and will probably have it up soon! 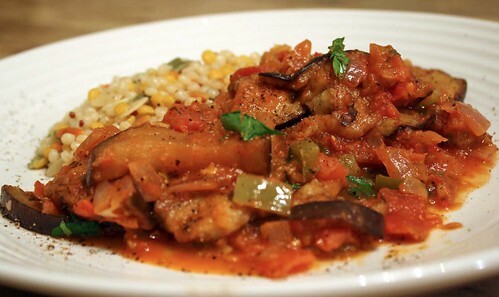 Another dish I made this week was eggplant in a tomato pepper sauce. This was very easy to make. I just cut an eggplant into small triangles and then pan fried them. I then made a quick tomato pepper sauce with fresh tomatoes and some canned, onions, garlic, and a green pepper. Seasoned it with some oregano, thyme, and of course salt and pepper. I threw the fried eggplant into the sauce and simmered it for a few minutes and Voilá I had an awesome dinner! I normally don’t like eating summer vegetables in the winter time but sometimes you get that craving for a summer vegetable. 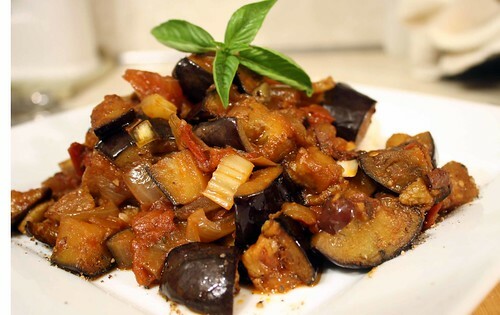 Although this eggplant dish doesn’t look too photogenic it was very tasty! I served it with a delicous product I just discovered at Trader Joe’s. It’s called Trader Joe’s Harvest Grain Blend, it basically features Israeli couscous, along with red and green orzo, split dried garbanzo beans, and red quinoa. I really like it because it cooks up so quick and it has so many different things in it. Next time your at Trader Joe’s pick this up, you’ll love it! I’ll leave you with my dog, Madison. This is her first appearance on my blog! I took this picture a while back but I just had to share it with everyone know because she worked so hard on our little “photoshoot”. 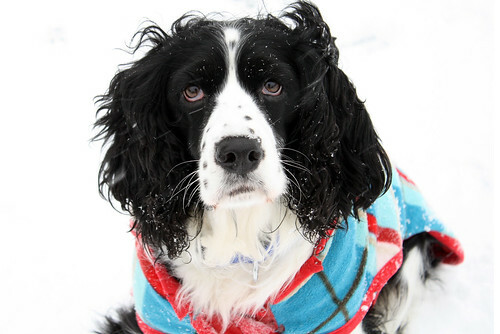 In this picture she is in the snow, which it is actually snowing right now as well. Look how serious she is! I am so excited for tomorrow because my school has issued a snow day! My school rarely gives out snowdays! It’s supposed to snow a whole lot here in New York! Madison says Hello to everyone reading!